How do you feel John Conboy has done as executive producer of GL? John Conboy is back as executive producer of CBS's Guiding Light after having walked out earlier this week. Conboy and show execs were at odds over the EP's contract with the show. According to show sources, Conboy was so upset that he literally walked out during contract negotiations. Now, however, CBS executives say that the disputed issues between Conboy, the network and Procter & Gamble Productions, which produces the show for CBS, have been ironed out. "Procter & Gamble, CBS and I agree that my work on Guiding Light is not finished," Conboy said in a statement. "I look forward to continuing our incredible partnership and all the terrific stories we have yet to tell." 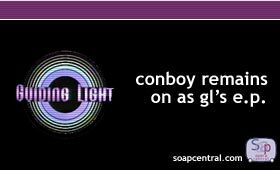 Conboy joined Guiding Light in December 2002. He assumed the executive producer slot vacated by Paul Rauch one month earlier. Conboy previously served as executive producer for The Young and the Restless and the now-defunct soaps Santa Barbara and Capitol. RELATED STORYY&E EP Shaughnessy will exit effective immediately.